Be prepared for several posts about packing, moving and unpacking. Because we are in full swing of Operation Moving OUT. It is a wonderful thing and I am very happy. But I do look around and wonder how the hell everything will get done. It's a er, um, fun? challenge with the kids "helping." The older ones are indeed pretty helpful, the younger ones not so much. Took my eyes off Wade for a few minutes to pack up a box, I thought he was happily watching Cars 2. But he was busy getting crafty and drawing a racetrack on his bed sheet. It cracks me up when people ask "Where are you moving?" and I tell them "down the street." People look less sympathetic. Next time someone asks I will look at them and say "overseas" and get the sympathy and attention I am looking for. Down the street, cross country or overseas, moving is messy. But it can be fun too. I am making some fun old finds as I empty the shelves,drawers and closets (some that haven't been touched in quite possibly a decade). 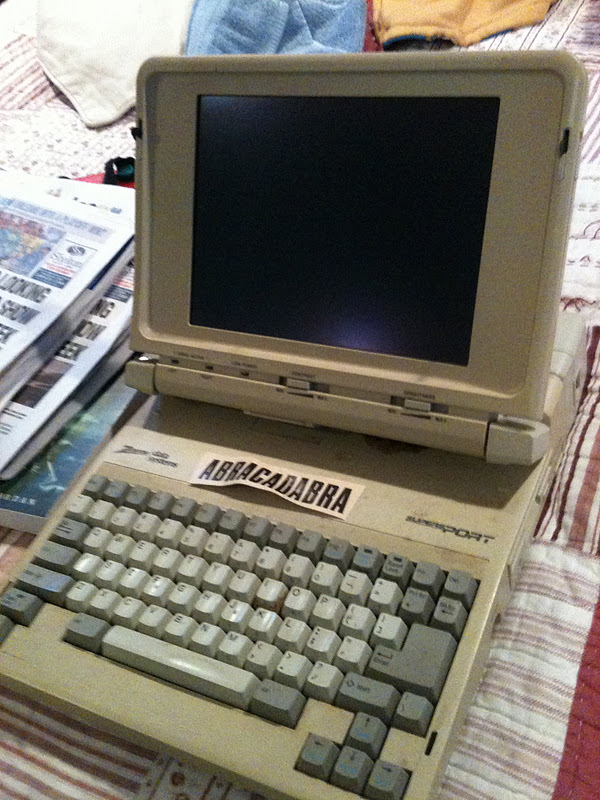 My super cool laptop from my post-college days. And my ancient looking phone that still had a message from the Starbucks guy asking if I would come in for a barista interview. Which I didn't get because I wasn't cool enough. Whatever, I'm still not cool enough to work there. It's messy, but it's also an adventure.